There are some excellent genealogies of the Balderston family, especially of the Colora, Maryland, branch. This web page does not attempt to either duplicate or replicate that, although it does draw upon others' work. Instead, this web page hopes to post as much detailed information as can be found about the Balderston/e family from as far back as possible and then through the immigrant John Balderston to Lydia Balderston who married Thomas S. Dunning in 1872. I would be very grateful to receive corrections to what I have posted here, or additional information a reader might have, especially if you have documented data to fill out the biographies of any of the individuals on this page. Please contact me at . This web page was constructed using Mozilla and consequently looks better with Mozilla or Firefox as the browser. Safari works well, too. The Gates' software and clones may not do quite as satisfactory a job. The name was said by one family story to have been "Boulderstone", given by neighbors to a man who lived on a very rocky and stony place. I am very skeptical of this etymology. For one thing, the geology of Norfolk tends to be sand or clay rather than rocky glacial debris. It reminds me of the explanation offered by Mrs. MacIntyre who claimed that her eponymous ancestor was engaged in makin' tires. A more convincing hypothesis is that the family is of Norse extraction, on the strength of Baldr, or Baldur, second son of Odin. Baldr is the Norse god of light, beauty, love, and happiness. Add on the stone/ston/son suffix, and that would make the family sons (children?) of Baldur. A family story of dubious authenticity tells of a Viking sailor washed up on the shores of Norfolk, and all Balderstones in Norfolk descending from him. More to the point, the first recorded use of the name in the British Isles was in Scotland in the 11th or 12th century. It is thought that the name then migrated south into England with settlement in Lancashire round the Preston area. From there it travelled further south and east to Norfolk where the earliest recorded mention found so far by Phillip J. Balderstone, a distant British cousin who has most kindly supplied this information, is of a Richard Balderston/e. RichardD Balderston/e was born in ca. 1550 in Norwich, Norfolk. See the explanation of the National Genealogical Society's Numbering System used on this web page. He married Judith WOOLSYE 13 November 1575 at St. Peter Mancroft in Norwich. [1a] Their children were born in Swanton Abbot, and persumably baptised in the old church of St. Michael there. When Richard Balderstone (identified as "of Claxton") died in 1624 he owned land in Little Barningham, a village 19 miles north of Norwich. Claxton is a parish in the Loddon district, 8.5 miles southeast of Norwich. These two locations are surprisingly distant from each other. RichardC, b. 22 Twelfth Mo., 1577; d. 1647; m. Judith __; remembered in his brother Timothy's will, 1638. Timothy was a weaver, a member of the powerful worsted weaver guild of Norwich. He was made a freeman of the city as a guild member in 1614. Norwich was an important center of the woollen cloth trade in the seventeenth century. In early 1637 Timothy and his daughter Katherine travelled to Holland, probably in connection with the cloth trade. Timothy's son John and his wife followed several months later. Timothy returned after a few months, and died the next year. In his will, he named his oldest daughter Katherine, his daughters Frances WENN and Anne, his three married sisters, his brother Richard, and his sons Timothy, Bartholomew, and John. Elizabeth, b. 1610; not mentioned in her father's will in 1638 so may have d. by then. e) Hannah, inherited £20 from Bartholomew Balderston. Timothy, not included on Phillip Balderstone's chart; may have d.y. Richard, not included on Phillip Balderstone's chart; may have d.y. Mary, b. 1623; not mentioned in her father's will in 1638 so may have d. by then. Possible children of Timothy and his second wife, Ann? BartholomewB Balderston, son of Timothy and Agnes, was christened 27 July 1617 at St. Martin in Palace Plain, Norwich. The church is near the cathedral, and the palace in question was the Bishop's Palace. The church was substantially rebuilt during the nineteenth century. Bartholomew died in 1665. He married Arabella __. She had been born in 1633 in Norwich. JohnA, b. 1647; d. 1717; m(1) Frances __; m(2) Lydia Scarf. a) Timothy (1680-1764), who was Mayor of Norwich in 1736 and again in 1751. His portrait was presented in 1735 by the artillery company of their Capt. Timothy Balderstone, Esq., to be hung in the New-hall. His memorial is in St. George Colegate Church. Here is a close-up of the tablet words. JohnA Balderston, son of Bartholomew and Arabella, was born in about 1647. His death has not been found in church records. He married twice, Frances __, who was buried in St. George Colegate church in 1696. Then John married Lydia Scarfe. 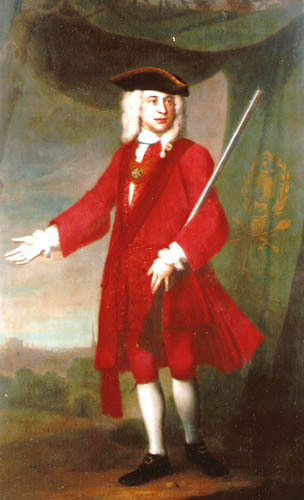 John's nephew Timothy Balderston (1680-1764) was Mayor of Norwich in 1736 and 1751. Would Timothy have had to be Anglican to hold that position? Timothy's brother Bartholomew was a strong Congregationalist. I do not know the religious affiliation of John. It is quite possible that he was a non-conformist, like his uncle John (1611-1686) and his brother Bartholomew, although the children of John and his second wife Lydia were baptized in St. Peter Parmentergate, presumably an established, Anglican church. That neither John's marriage nor death have been found in church records offers a hint of some sort. Arabella1 m. John AID or Aide or EADE, and had sons and at least one daughter, Arabella, who were left £50 each by their grandfather's nephew, Bartholomew Balderston, the Norwich grocer. Sarah1, bapt. 21 Fourth Mo., 1701 at St. Peter Parmentergate; m. Benjamin LAURENCE, a cooper; he had been apprenticed to John Cook, cooper, and got his freedom in 1722. Sarah and Benjamin had a daughter, Elizabeth Laurence, who inherited £50 from her mother's first cousin, wealthy grocer Bartholomew Balderston. Elizabeth m. Daniel BENTLEY, a cordwainer. They had a daughter, Elizabeth Bentley, b. in Norwich 1767, in the parish of All Souls, whose daughter published a book of poetry in 1791. John1 Balderston was born in 1702 in Norwich, and was baptised at St. Peter Parmentergate 22 Seventh Month [September]. John died in 1778 in Pennsylvania. He and Hannah COOPER were married 21 October 1737 in Gwynedd Meeting. She was born on March 29, 1719 in Middletown, Bucks County, the daughter of Jonathan and Sarah (HIBBS) Cooper. By 1739 John had not only worked off his indenture, but was established well enough to marry Hannah Cooper of Upper Makefield, Bucks County. She was a Friend, so John joined that Religious Society in 1739 at Gwynedd Meeting in what became Montgomery County. Shortly after they married in Gwynedd Meeting. The couple lived first in North Wales, then in Upper Makefield, and finally settled later in life in Solebury. John requested a certificate of removal for himself, his wife, and his minor children Jacob, Isaiah, Mordecai, Sarah, Lydia, and Mary on 7 April 1767 from Wrightstown Meeting to Buckingham Meeting. This marked his move from Upper Makefield to Solebury. 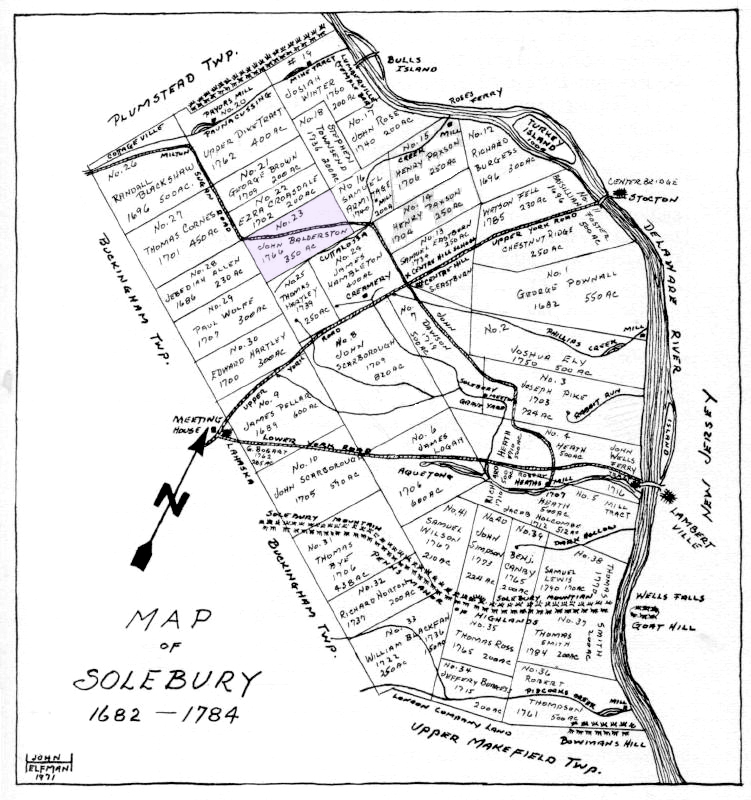 Eastburn Reeder, chronicler of Solebury real estate transactions, wrote that John purchased 250 [except on Reeder's map it is labelled 350, as you can see to the right] acres in Solebury. Reeder explained that the land was a quarter of an original grant of 1000 acres by William PENN to Richard THATCHER, dated 4 July 1682. Richard bequeathed 250 acres of it 13 December 1690 to his sons, Richard and Bartholomew Thatcher. They sold it to Samuel BEAKES 6 June 1700 who had it surveyed and confirmed by patent 14 March 1703. Beakes sold it to William CHADWICK 4 March 1725/6. Chadwick is believed to have erected the first buildings on it. But one day while being ferried across the Delaware River he fell overboard and drowned. His widow Ellen and children sold it to John Balderston 21 June 1766. It adjoined land of Samuel ARMITAGE, James HAMBLETON, Thomas HARTLEY, Paul WOLFE, Jebediah ALLEN, and Ezra CROASDALE. Sugan Road ran diagonally through it, west to east. When war broke out between the colonial rebels and the British army, Friends determined to uphold their witness for peace. Their testimony from their earliest days in the mid seventeenth century against oaths was put to a severe test. Whichever side controlled an area tried to exact oaths of loyalty from the inhabitants. Friends refused to swear, based on Jesus' clear injunction to "swear not at all". When John Balderston was tendered the Oath of Allegiance by the rebels/patriots, he refused on grounds of conscience to take it. Friends refused to participate in the local militias. John, of course, was too old to be called up. But his sons John, Jonathan and Mordecai were listed as being members of Captain Lanning and Captain Kestor's regiments in Solebury. All males between certain age limits were listed in a militia company, and their names appear that way in the Pennsylvania Archives, But just because they were listed does not mean they participated in war. One must also read the Friends records. Buckingham Monthly Meeting minutes note that Mordecai Balderston paid a fine for not going out as a soldier. Presumably his brothers also refused to participate, but also refused to pay their fine. Goods would then have been distrained, often worth more than the fine. Friends labored with Mordecai, but he didn't seem to see how his behavior undermined Friends' corporate witness against war or participation in war. First Month 4, 1779 he was disowned. Friends also refused to swear oaths, finding corroboration of their insistence on a single standard of honesty in the injunction of Jesus to "swear not at all" (Matthew 5:34). One of the penalties for refusing to take the oath or affirmation of allegiance to the rebel government was to be barred from administering estates, serving as an executor, and acting in other civil capacities. John had signed his will 29 Fourth Month 1773. He died 9 July 1778. He had named his wife Hannah and son John executors. But John, Jr. was prohibited from executing it because of his Quaker witness against oaths. Instead his brother Bartholomew filed a caveat on 11 November, and the will was probated 22 November that year. The will included the legacy bequeathed to John's children by Bartholomew Balderston of Great Britain, deceased, John's first cousin. In 1784 the "widdow Balderston" owned 150 acres, one dwelling, a barn, and had a household of three white people. Hannah died 26 May 1792, in Solebury. b) Mark Balderston, twin, d.y. c) Mirab Balderston, twin, d.y. d) Hannah Balderston, m. 1817 John MITCHELL; no children. e) John W. Balderston, m. 1800 Elizabeth BUCKMAN; resided in Fallsington; 7 children. f) Ann Balderston, m. 1823 James SIMPSON; no children. g) Ezra Balderston, d. as an infant. h) Mark Balderston, b. 5m/1/1778 in Solebury; d. 9m/3/1823; m(1) Ann BROWN; m(2) 1805 Elizabeth LLOYD, daughter of Benjamin and Sarah (CHILD) Lloyd (Elizabeth d. 10m/17/1826); 8 children. Timothy, b. 10 Dec. 1745; d. 14 May 1827; m. 4 Apr. 1770 Rachel TWINING, daughter of John and Sarah (DAWES) Twining; the family removed from Wrightstwon MM to Falls on a certificate dated 4/10m/1796; 9 children. Jacob, b. 27 Feb. 1748/9; d. York, Penna. ; m. 23 Nov. 1769 Mary KENNARD, daughter of Anthony and Elizabeth; removed to Maryland; no children. Hannah, b. 11 March 1751/2 OS [See an explanation of Friends' Dates. ]; d. 1833 in Jefferson, Ohio; m. 28 First Mo. 1767 William BEANS, son of Timothy and Rebecca (PAXSON) Beans of Buckingham MM; he was b. 15 July 1740, and d. 14 Dec. 1847 [seems suspect: 107 years old? ]; 11 children. Isaiah, b. 24 Feb. 1753 NS; d. 5 Sept. 1817; m. Martha ELY; 5 children. Mordecai, b. 31 Jan. 1755; d. 21 Apr. 1820 in Mt. Pleasant, or Short Creek, Ohio; m. 11 Feb. 1778 Deborah MICHENER, daughter of Mordecai and Sarah (FISHER) Michener; Deborah was b. 3 Apr. 1757 and d. 4 Oct. 1828; had 11 children. Sarah, b. 21 Feb. 1757; m. 5 May 1774 Hugh ELY, Jr., brother of Martha who m. Sarah's brother Isaiah. b) Mary Cooper who married ___ PETERS. Isaiah2 Balderston, son of John and Hannah, was born 24 February 1753, and died 5 September 1817. On 10 November 1772 he married Martha ELY, daughter of Thomas and Sarah (Hibbs [Lowther?]) Ely, and moved to Montgomery County. They removed to Deer Creek Meeting in Harford County, Maryland. Eventually Isaiah was recorded as a minister there. A Friends minister (before the latter half of the nineteenth century) was a man or woman whose spiritual life and messages offered in meetings for worship were recognized by members of his or her meeting to be authentic gifts of the Holy Spirit. There was a process by which such Friends were recognized and minuted. There was no single word to describe these Friends, however. They were referred to as recognized, recorded, or approved ministers. There were no shades of meaning differentiating these terms, that I am aware of. Ministers met for monthly, quarterly, and yearly "select" meetings for business with other ministers, elders, and overseers, in addition, of course, to attending the general monthly, quarterly, and yearly meetings for business. A minister among Friends was expected to have a “competence”, that is a secular livelihood that supported the family and made possible the unpaid travel and ministry among Friends to which the individual was called. If a minister felt a Divine call to travel or undertake other ministerial labor, he or she brought it to the monthly meeting for Friends’ approval. If the meeting had unity with the minister and his or her proposed travel or project, the meeting would minute it. The minister would carry the minute to any other meetings visited, and the clerks of those meetings would endorse it with a few words evaluating the visit. In this way individual Friends were held accountable to the larger body. Ennion Williams, Jospeh Townsend, and William Brown accompanied him on his visits to Elk Ridge Landing, “Reisters Town”, and “Gunpowder Forrest”. With the population of Baltimore growing quickly, it was not surprising that Friends on the west side of town pushed for a new meeting more conveniently located to them. On 13 October 1803 Baltimore Monthly Meeting appointed a large committee of 21 men including Isaiah and Ely Balderston to unite with a similar committee of Baltimore Yearly Meeting to look into the subject, and perhaps explore the possibility of beginning to raise funds. Things moved relatively quickly after that. Land was purchased on Lombard Street and a meeting house constructed. On 12 March 1807 Lombard Street Preparative Meeting requested monthly meeting status. The two meetings were to be called Baltimore Monthly Meeting for the Eastern District and Baltimore Monthly Meeting for the Western District. Isaiah and Hugh Balderston were among those who transferred their membership to the Western District. Relations between the two districts soured when, in 1809, the Western District inquired into acquiring a financial interest in a portion of the property of the Eastern District. He was religiously concerned for his fellow beings, who laboured under confinement, and with the approbation of his friends, frequently visited them in prison houses and other public institutions, and sympathising with them in their afflictions, was favoured to administer suitable counsel and advice. He was also much exercised respecting the African race, using endeavours, as way opened, to promote their liberation and religious improvement. Sensible of the important station which he believed himself called upon to fill, and how liable he might be to deviate from the true Guide, he was desirous of the counsel and admonition of his friends, whenever it appeared necessary . . . . He was not frequent in his appearances in the ministry at home, but concerned to labour after a right qualification in solemn silence, in which true worship is to be performed; and when favoured with clear openings, his communications were instructive and edifying. His mind was at different times drawn in gospel love, to visit Friends in several of the neighbouring States . . . . In all such visits, he was careful to have the approbabtion of the meeting to which he belonged; and returned with the expression of those meetings amongst which he had been, that his services had been acceptably received. He was remarkable for his free, open disposition, and for a becoming liberality towards those of other religious persuasions, which with his regular upright conduct through life, had a tendency to gain their affections and esteem. The sick and afflicted were also peculiar objects of his attention and sympathy, and by his frequent visits to such, he demonstrated his concern and fellow feeling for them . . . .
Sarah3, b. 30 Nov. 1773; m. 16 Nov. 1791 at Deer Creek, Nicholas COOPER, son of Nicholas and Sarah Cooper; removed to Ohio; 12 children. Ely, b. 9 May 1776; m. 16 Nov. 1797 at Baltimore Esther BROWN, daughter of William and Elizabeth Brown; d. 7 Apr. or May 1853; 11 children. Hugh, b. 22 Dec. 1782; m. 23 Dec. 1802 in Baltimore Margaret WILSON, daughter of John and Alisanna Wilson; compiled family history in 1817-19; d. 14 June 1860. Jonathan, b. 10 June 1785; m. 21 Apr. 1808 at Third Haven, Elizabeth YARNALL, daughter of Uriah and Martha Yarnall; d. 29 Sept. 1819. Ely3 Balderston, son of Isaiah and Martha (Ely) Balderston, was born 9 May 1776 and died in 1853. On 16 November 1797 he married Esther BROWN at a meeting of Friends held at Baltimore. She was born 30 December 1775, the daughter of William and Elizabeth (Lacey) Brown. 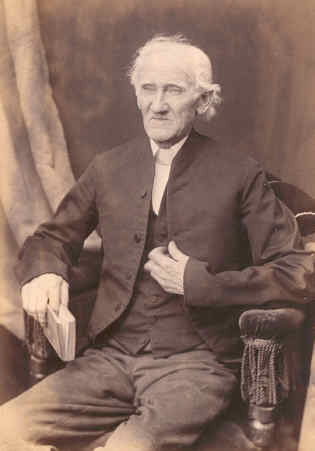 This image is of a daguerreotype of Ely as an old man. Esther died before this technology had been invented. The couple settled in Baltimore. Out of eleven children born to them, only five reached adulthood. Esther died 12 February 1829 in her 54th year. Ely died 7 April or May 1853 after a long illness. He was in his 77th year. Elizabeth4, b. Dec. 1798; m. ___ HAYWOOD; d. 1871; 6 children. Martha, b. 8 Aug. 1800; m. 1 July 1823 John KELSO; d. 14 Jan. 1883; 7 children. Isaiah, b. 27 May [torn]; d. 27 Sept. 1802. Marcellus, b. 5 Nov. 1803; unmar. ; d. Dec. 1871. Mary, b. 22 Mar. 1805; d. 7 Aug. 1806. William, b. 10 July 1807; d. 4 May 1808. Ann, b. 2 July 1809; d. 19 July 1809. Samuel Fothergill, b. 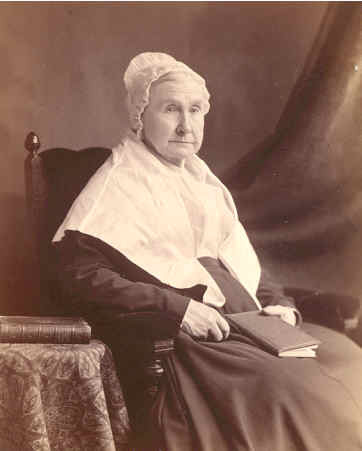 22 Nov. 1810; m. Martha Ann GRIFFITH; d. 5 Jan. 1895 in Philadelphia; 7 children. Joseph, b. 14 Oct. [torn]; d. 14 Jan. 1813. Hannah, b. 15 Mar 1818; d. 9 Oct. 1861. Samuel F.4 Balderston, son of Ely and Esther (Brown), was born 21 November 1810 in Baltimore, and died 5 January 1895 in Philadelphia. On 11 November 1835 Samuel and Martha Ann Griffith, the daughter of John and Rachel (Hackney) Griffith, were married in the Hopewell Meeting house. Samuel attended Westtown School for two years. Then he served an apprenticeship to the leather business. But because of his father's financial difficulties Samuel learned the wall-paper business, which he carried on in connection with his father's queensware business in Frederick, Md. At the age of nineteen Samuel made the decision to adopt plain dress, and with this he gave up everything which interfered with a consistent maintenance of the principles of the Society of Friends, "to which he was ever after a devoted adherent, believing that they represented the pure teachings of the Gospel of Christ." He was recorded a minister at the age of twenty-four years. "In the exercise of his gift as a minister, he was dignified, earnest, clear, forcible and convincing, ever having an eye single to the glory of God. He rarely repeated in his sermons any part of a former communication, but brought forth from the treasury matter both old and new, often quoting some extracts from pious authors to elucidate his subject." In 1833 he went to Frederick County, Virginia, and taught school. He then went to Ohio, where he taught for one year before returning to Frederick County. In 1835 he married Martha Ann Griffith, shown to the left as a much older woman. Next they removed to Bellefonte, Pa., where Samuel taught at the Academy. Samuel and Martha Ann lived at 1513 Oxford Avenue, Philadelphia, but by 1882 had moved to 2018 North Twelfth Street where they remained the rest of their lives. Samuel's eyesight failed in his old age. Martha died 8 November 1894, and Samuel died 5 January 1895. His obituary is in The Friend. "He was widely beloved for his great spiritual preaching, his knowledge of the scriptures and his saintly life." Isaiah5 , b. 23 July 1837; d. 7 July 1920; m. (1) Adelaide BRACKNEY 21 June 1855. She d. 3 Nov. 1885, and Isaiah m. (2) Ellen DAWSON. She d. 19 __ 1912. No children. John Ely, b. 2 Jan. 1839; d. 19 Sept. 1915; m. Rachel S. FOGG 25 Jan.1860; 3 children. Rachel Esther, b. 12 Oct. 1840; d. 5 Jan. 1916; called by her neices and nephews, "Aunt Rachie"; cared for her parents in their old age; after the death of Cecilia, Rachie moved in with her brother Marcellus; Rachel was unmarried. Marcellus "Cellie" , b. 12 Nov. 1842; d. 9 Nov. 1935; m. Cecilia (spelled in some notes Cecelia; called "Cecie") A. WRIGHT 6 June 1876. She d. 26 Oct. 1903. No children. Mary, b. 11 Oct. 1844; m. Edward LIVEZEY, MD, 5 Apr. 1866. He d. 15 Apr. 1876; 4 children. Edward was the son of Thomas and Rachel R. (Richardson) Livezey. Samuel F., b. 23 Feb. 1847; d. 10 Mar. 1847, aged 2 weeks and 1 day. Thomas Chalkley, b. 9 Feb. 1848; d. 7 Jan. 1921; m(1) Mary F. WETHERALD 25 Nov. 1887. She d. 9 Oct. 1890. Thomas m(2) Fannie BAYNES 8 Jan. 1892. She d. 4 Apr. 1909. He m(3) Rachel LOCKERBIE 12 Apr. 1911. No children. Lydia, b. 4 Dec. 1849; d. 27 June 1941; m. 8 Oct. 1872 Thomas Stevenson DUNNING, MD; 8 children. Lydia.5 Balderston, youngest child of Samuel F. and Martha Ann (Griffith) Balderston, was born in Philadelphia on 4 December 1849, and died there 27 June 1941. 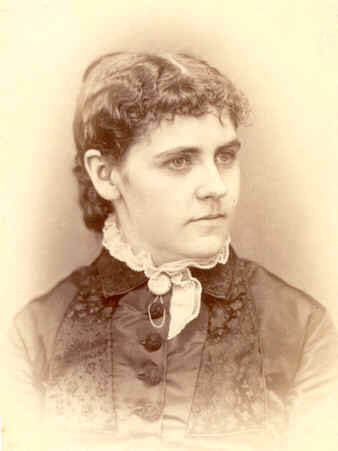 She was married on 8 October 1872 to Thomas Stevenson DUNNING, MD. Lydia is pictured to the right, probably shortly after her marriage when she was no longer a Friend, and not feeling any obligation to wear plain dress. Margaret Dunning6, b. Sept. 20, 1873; died Dec. 13, 1965; m. Walter Scott ADAMS; one daughter. Martha Kelso Dunning, b. Mar. 23, 1875; died Mar. 2, 1965; m. Charles S. PAXSON; 4 children. Thomas Snively Dunning, b. Sept. 30, 1876; died Feb. 12, 1954; m(1) Elizabeth NITTINGER, ended in divorce; m(2) 12 Nov. 1943 Louise Krumbigh WENTZEL; one daughter with first wife. Louise had a son by a previous marriage. Mary Esther Dunning, b. Oct. 31, 1878; died Dec. 5, 1969; m. William Bonaparte SHOE; one daughter: Lucy Taxis Shoe, m. (his second wife) Benjamin MERRIT; no children. John Erasmus Dunning, born Oct. 20, 1880, died April 13, 1885. Lydia James Dunning, b. Oct. 11, 1883; died July 4, 1946; unmarried. Cherub Dunning; died at birth, Dec. 12, 1891. Anna Bartlett Dunning, born May 27, 1894; died Sept. 25, 1915 of tuberculosis; unmarried. To continue the story of this family, go to the Dunning page, or see 1328 North Fifteenth Street: the Dunning Family and Its Things, available on Lulu.com. If you have additions or corrections to this web page, I would be delighted to hear from you. Contact me via e mail at . Go to the index of other lines that are included in this website (not all of them have been posted yet). Go to the Paxson home page. This page was posted 12/21/2007, and updated most recently on 5m/17/2010. The full bibliographical citation is given the first time a source is mentioned, but is not repeated each time that source is cited. Scroll up til you find the first mention and there you will find the complete citation. This section has not yet been completed. My apologies. Laura (Taylor) Ecroyd "Ancestor Memorandum", Holograph manuscript in the collection of the Library of the Western Reserve Historical Society, Cleveland, Ohio. 1a. The marriage is file #3499, as posted on FreeREG, the U.K. Parish Register Information web page. My thanks to Phillip J. Balderstone for this information. My thanks to Phillip J. Balderstone of Cambridge, UK, for the information on Richard Balderston/e and his family, except where otherwise noted, e mail April 22, 2010, and his chart, sent 4/26/2010. Phillip's sources include Parish Records of Norwich, Millenium Library, Norwich; Percy Millican, ed., Registers of the Freemen of Norwich, 1548-1713 (Norwich: Jarrold & Son, Ltd., 1934); Marion Balderston and Hortense B. C. Gibson, Balderston Family History (1973); and, www.freereg.org.uk/, among others. 2a. Most of the information of Timothy and his family is from Phillip J. Balderstone, for which I am grateful. See also, Ancestral File submission AF97-113374 on FamilySearch.org, submitted by M. Dale Robertson of Salem, Ore. The information on St. Martin's is from www.norfolkchurches.co.uk/norwichmartinpalaceplain/norwichmartinpalaceplain.htm, seen 4m/22/2010. 2b. My thanks to Phillip J. Balderstone of Cambridge, UK, e mail April 22, 2010, for information on John Balderston/e and his family, One of Philip's sources was Charles B Jewson, ed., Passengers from Great Yarmouth to Holland 1637 - 1639 (Norwich: Norfolk Record Society 1954). I have not had an opportunity to see this volume for myself. For more on early Congregationalists in Norwich, see heritage city. The information on John Balderston/e and his family is thanks to Phillip J. Balderstone. See note 2 above for his sources. It is possible that some of this data may be found on FamilySearch.org, Batch No. C047901, Sheet 00 (for St. Martin at Palace, dates from 1538 to 1855); source call no. 0894701. The Old Meeting House (Non-conformist) records are batch no. P018351, from 1657 to 1681. I have not had an opportunity to look at these records myself. 3a. The marriage is file # 2617, as posted on FreeREG, the U.K. Parish Register Information web page. Bartholomew and his son as grocers and freemen, is from Percy Millican, ed., Registers of the Freemen of Norwich, 1548-1713 (Norwich: Jarrold & Son, Ltd., 1934). My thanks to Phillip J. Balderstone for this information. 3b. 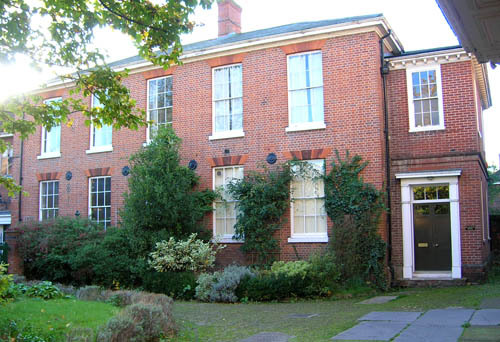 See The Old Meeting House on Norwich Heart's web site. 3bb. See M. Winston, "The Bethel at Norwich: an eighteenth-century hospital for lunatics", in Medical History, 38(1) (Jan. 1994), 27-51, available on the web. 3bbb. There is a whole book on it. See Nigel Goose and Leanne Moden, A History of Doughty's Hospital, Norwich, 1687-2009 (University of Hertfordshire Press, forthcoming, Sept. 2010). See a blurb. 3c. Balderston and Gibson, Balderston Family History (1973), 24-5. My thanks to Phillip Balderstone for sending me a copy of these pages. Account extracted from a letter written by John Balderston of Buckingham, Bucks Co., Penna., dated 28 7th mo., 1806, to the father of Hugh Balderston, who extracted the notes 1817-19. Typed purple ditto account, "Our Family Record for four Generations" by Martha Balderston Kelso (from Lucy T. Shoe Meritt to MJPG), p. 1-2. Dutch spelling (other than from Friesland), from a Dutch prof. of Dutch and German language, e mail from Eileen Talamantez, 4/18/2007. 5a. Marion Balderston and Hortense B. C. Gibson, Balderston Family History (1973), 25. My thanks to Phillip Balderstone for sending me a copy of three pages. 5b. Balderston and Gibson, Balderston Family History (1973), 25. 5c. See the Norwich Historic Churches Trust web page. The name seems to have come from St. Peter per Mountergate, a nearby street. http://www.geograph.org.uk/photo/114696, seen 5m/6/2010. 5d. Balderston and Gibson, Balderston Family History (1973), 24-5. My thanks to Phillip Balderstone for sending me a copy of these pages. 7a. Balderston and Gibson, Balderston Family History (1973), 29, state that no record of John as a redemptioner or of his indenture has been found. But this is what was recorded in the Recollections. My thanks to Phillip Balderstone for sending me a copy of this page. Balderston and Gibson, Balderston Family History (1973), 29. Record of John's membership and his marriage should be in Gwynedd Meeting records. Eastburn Reeder, Early Settlers of Solebury Township, Bucks County, Pa. (Doylestown, Pa.: The Bucks County Historical Society, 1971), map frontispiece, p. 58. 10a. Balderston and Gibson, Balderston Family History (1973), 31. PA, ; Buckingham Monthly Meeting Men's minutes, 12m/16/1778, 1m/4/1779; and 2m/1/1779. Bucks Co. Will Abstracts, 1:326, citing Book 4, p. 17. Account extracted from a letter written by John Balderston of Buckingham, Bucks Co., Penna., dated 28 7th mo., 1806, to the father of Hugh Balderston, who extracted the notes 1817-19. Typed purple ditto account, "Our Family Record for four Generations" by Martha Balderston Kelso (from Lucy T. Shoe Meritt to MJPG), p. 1. The children are also given in 8.Anna Miller Watring, Bucks County, Pennsylvania Church Records of the 17th and 18th Centuries Vol. 3 (Bowie, Md. : Willow Bend Books, 2003), 8. Ruth B. Lippincott, ed., The Balderston Family: Colora Branch; A Short History of Lloyd and Catharine Canby Balderston of Colora, Maryland and Their Children told by Their Children and Grandchildren with some Genealogical Records (Colora, MD: 1959). John returned his certificate from the Monthly Meeting in Norwick [sic], County of Norfolk, Great Britain on Tenth Mo. 7, 1766, to Wrightstown MM. Watring, Bucks County, Pennsylvania Church Records of the 17th and 18th Centuries, 3:51, 52. See also, Balderston and Gibson, Balderston Family History (1973), 30-31. 16a. Buckingham Monthly Meeting Men's minutes, 2/11m/1778, p. 181. 16b. Buckingham Monthly Meeting Men's minutes, 16/12m/1778, p. 184.
http://www.pennock.ws/surnames/fam/fam23453.html. Their certificate of removal from Wrightstown MM was dated 4/10m/1796. Daughters Sarah, Elizabeth, and Rachel, being of age, were issued their own certificates. Watring, Bucks County, Pennsylvania Church Records of the 17th and 18th Centuries, 3:27.
http://www.pennock.ws/surnames/fam/fam23455.html; William Beans brought a certificate from Buckingham MM; the marriage was recorded in Wrightstown MM records as having taken place on 28/1m/1767. Watring, Bucks County, Pennsylvania Church Records of the 17th and 18th Centuries, 3:52. 20a. Buckingham Monthly Meeting Men's minutes, 5/4m/1773, p. 94; 3/5m/1773, p.96; 1/2m/1779, p. 187. For a bibliography of material relating to this type of Quaker minister, in the past and present, see http://www.fgcquaker.org/traveling/bibliography.html. oops, these notes have not yet been entered. A Memorial Concerning Isaiah Balderston, Deceased (Phila. : Joseph Rakestraw, 1857). Approved at Monthly Meeting 7 Fifth Month 1818, signed by George F. Janney, Clerk; and by the Quarterly Meeting 4 days later, signed by Philip E. Thomas, Clerk. Account extracted from a letter written by John Balderston of Buckingham, Bucks Co., Penna., dated 28 7th mo., 1806, to the father of Hugh Balderston, who extracted the notes 1817-19. Typed purple ditto account, "Our Family Record for four Generations" by Martha Balderston Kelso (from Lucy T. Shoe Meritt to MJPG), p. 3. Account extracted from a letter written by John Balderston of Buckingham, Bucks Co., Penna., dated 28 7th mo., 1806, to the father of Hugh Balderston, who extracted the notes 1817-19. Typed purple ditto account, "Our Family Record for four Generations" by Martha Balderston Kelso (from Lucy T. Shoe Meritt to MJPG), p. 4. The text of a holograph letter signed by Ely's son, Samuel F. Balderston, and an explanation for the financial difficulties can be found in 1328 North Fifteenth Street, Chapter 7, "Balderston Bits". The book is available at stores.lulu.com/MJPG. Typed purple ditto account, "Our Family Record for four Generations" by Martha Balderston Kelso (from Lucy T. Shoe Meritt to MJPG), p. 6. Obituary, The Friend, Third Mo. 6, 1897, p. 261-2. Joint Committee of Hopewell Friends, assisted by John W. Wayland, Hopewell Friends History 1734-1934 Frederick County, Virginia (Strasburg, Virginia: Printed by Shenandoah Publishing House, Inc., 1936), 155-56. Obituary, The Friend, Third Mo. 6, 1897, p. 261. Memorial Minute for Marcellus Balderston, Proceedings of the Yearly Meeting of the Religious Society of Friends of Phialdelphia and Vicinity, 1936, 181. Northern District of Philadelphia Monthly Meeting, 4/24/1849, men's meeting minutes, 1846-1858, NDMM, microfilm roll 74, Quaker Collection, Haverford College. There were three major divisions among Friends in the 19th century. The first, in 1827-28 was between the "Orthodox" who wanted Quakerism to adopt a more orthodox Protestant theology, and the so-called "Hicksites" who opposed them from a variety of positions. In the 1840s and 1850s there were divisions within many Orthodox yearly meetings (but not Philadelphia) between the "Gurneyites" who stressed the authority of the Bible and seemed to want to become more like the Methodists, eventually hiring pastors and having programmed services, and the "Wilburites" who favored the distinctive Quaker understandings of the Light of Christ in the heart and an unprogrammed meeting for worship with unpaid ministers. The Paxson family in Bucks County were mostly Hicksite; the Balderstons were mostly Wilburite. This quote exemplifies one of the theological litmus tests used by Friends against one another in this period. Edwin B. Bronner, ed., An English View of American Quakerism: The Journal of Walter Robson 1877 (Phila. : Memoirs of the American Philosophical Society, v. 79, 1970), pp. 111, 117, 143. Memorial Minute for Marcellus Balderston, 181-82. Memorial Minute for Marcellus Balderston, 182; and reminiscence of Lucy T. Shoe Merrit. McElroy's Philadelphia City Directory, 24th edition (Phila. : E. C. & J. Biddle & Co., 1861); Gopsill's Philadelphia City Directory of Residents (1874, 1876, 1878, 1882, 1886, 1889, 1890, 1891); Wm. H. Boyd's Son, S. Fred Boyd, comp., Boyd's Co-Partnership and Residence Business Directory of Philadelphia City (Phila. : Boyd's Directory Office, #234, 236 S. 8th St., 1897). Obituary, The Friend, Third Mo. 6, 1897, p. 262. Balderston family records in Butler's Edition. The Holy Bible, containing the Old and New Testaments: translated out of the original tongues, and with the former translations diligently compared and revised. in 2 vols. (Phila. : E. H. Butler & Co., 1849) Presented to the Delaware Historical Society by Lucy Shoe Meritt. Letter to MJPG from Lucy T. Shoe Merrit.